Can anyone tell me why vintage inspired dresses are so popular? There are many reasons out there, but the fact is that great style is timeless. My personal opinion is because some of the styles from back-in-the-day were so fresh and classy, but what do I know about fashion anyway? It's all about personal taste I guess. Some styles you like and others you don't. As travelers, we get to see a lot of styles in European countries like Paris, London and Belgium as well as the breezy chic styles of the Caribbean in countries like Trinidad and Tobago, Barbados and the Dominican Republic. We have also witnessed the vibrant colors of the fabric in the French Caribbean islands of Martinique and Guadeloupe as well as Colombia and Panama. What we have realized is style is evident everywhere and beauty is indeed in the eyes of the beholder. In many of the places I have mentioned we have noticed a “Bringing back of sorts,” a recycling of the old, not only in fashion, but in music, movies and well, in pretty much everything else. One of the best places to find retro fashion, from bathing suits to vintage styled dresses is on Amazon. These are four of the popular vintage styled dresses I found while browsing the online shopping store. Let me know what you think? Would you wear any of these four vintage styled dresses? Where would you wear them, at a cocktail party, at the club or while traveling to your next exotic destination? Do you know you can save a wad of cash if you book a flight and hotel package to your next destination? Who doesn’t want a hot red polka dot dress in their wardrobe? If you can't live without it then you may love this sleeveless vintage 1950's floral dress. Isn't this the idea evening dress if you're going to a cocktail or garden party, or maybe you're on a cruise ship and you plan spending the evening dancing or relaxing in the lounge with new friends? There are several patterns to choose from and the material is a mixture of 90 % cotton and 4 % spandex. Please note that the material of other colors and patterns may have a different composition. This scoop neck, sleeveless vintage styled dress can be washed by hand, your washing machine or your dry cleaner can do all the work for you. You know, if that's your thing. You … yes you, you prefer something with straps right? 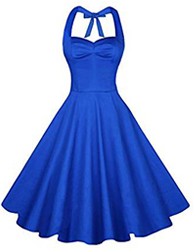 If you do, then these vintage halter strap dress may be the ideal dress for you. They come in solid colors, polka dots and patterns. The material is also a mixture of cotton and spandex. It has a v-neckline with wide halter straps and the zipper is concealed at the side. The halter straps are long enough so that it can be tied into a bow. This knee long swing dress has an elastic back design, but does not have bra pads inside the dress. The dress is machine washable and you can wash it by hand, but if you want to keep it for a while just don't send it to the dry cleaners. Dinner, tea, cocktail or evening party, where would you wear it? This floral boat neck sleeveless vintage dress looks stylish and comfortable. Picture yourself in this number heading out to a wine and tapas bar in Spain or probably spending the evening on a river cruise in Paris or having cocktails and spicy food at the exotic Sandals Resort in the Caribbean. Maybe even heading to an evening of horse racing in London, of course you'll have to get the top hat to go with it. The dress comes with a belt and should only be washed in cold water and by hand. No shortcuts, don't throw this baby in the washer. They come in solid colors, floral and polka dot patterns as well. 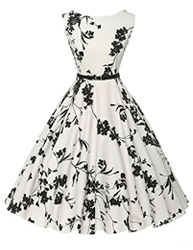 This vintage style dress also has a concealed zipper at the back and is described as a 1950s circle swing style. Is this swing your style? Are you daring enough to wear this bright yellow vintage styled number? If not, don't worry because it comes in a lot of other colors, as well as in plaid and polka dots. If you are into really bright colors you can choose from among many colors including grass green, red and blueviolet. This knee length swing dress has a pleated bodice design; cap sleeves and is 95 % cotton and 5 % spandex. The material for other colors and patterns may have a different composition. This vintage style dress should only be washed by hand. Have you bought any of these vintage styled dresses? We would love to know what you think about them. Honestly!